MV The Fairmile at her mooring in Brixham. MV Western Lady III was the name given to the Fairmile B motor launch RML497, on her entry to civilian service, as a passenger motor vessel for Western Lady Ferry Service. She is presently named The Fairmile, and operates for Greenway Ferry on their day cruise route from Torquay and Brixham to Dartmouth and Greenway. The Fairmile is a wooden hulled passenger vessel. Her hulls-form is very fine for a vessel of her type; it is based on a destroyer hull, albeit much smaller, as her original speed was some 20 knots. The hull is split into watertight compartments - a forward compartment houses a very basic passenger lounge, which the present owners intend to use as a museum area, the midships compartment is the engine room, housing twin Glennifer diesels, and an aft compartment contains the toilet facilities. The main deck has a forward open passenger deck. Aft of this, the forward deckhouse contains a chart room. In the centre of the main deck is a raised open deck area, surrounding the funnel, and with the open flybridge above the chartroom. Aft of the funnel is the main passenger lounge, originally the sick-bay, now named "Churchill's", in honour of Winston Churchill, who was First Lord of the Admiralty at the time of the vessels's commissioning. The saloon is decorated with memorabilia of Churchill, including his profile etched on the side windows, and contains a bar. Both of the deckhouses are surrounded by an open passenger promenade deck. At the stern of the vessel, the former open deck has now been enclosed with an awning. RML 497 was built to the standard Fairmile B motor launch design, and was one of around 650 of the class built. The design was very adaptable, being fitted with pre-drilled rails for different uses - the Rescue Motor Launch (RML) type of which around 50 were built, including RML497 were fitted with a sick-bay aft of the funnel - the present lounge. RML 497 was built in 1941, and commissioned in July 1942. 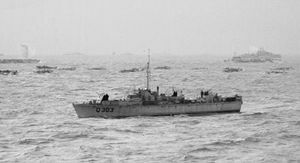 She was originally stationed with the 62nd ML Flotilla, based at Portland, Dorset, then in January 1944 was transferred to Kirkwall, in the Orkney Islands, being used for anti-submarine target towing. In August of the same year she was sent to Appledore, North Devon. She was later transferred to the 69th Flotilla at Felixstowe, before being decommissioned at the end of the war, and sold at Itchenor in Chichester Harbour. In 1946, Mr Edhouse of Totnes purchased four of the RMLs, and converted them for use as passenger vessels on a ferry service from Torquay to Brixham, across Torbay in South Devon. The ferry had been run up until 1934 by the Devon Dock, Pier & Steamship Co, but had then lapsed, due to the vessel used, SS King Edward failing her boiler survey. The four RMLs were named Western Lady, Western Lady II, Western Lady III and Western Lady IV. All were re-engined, as their original engines used a fuel with too high an octane value for passenger service; This reduced their top speed from 20 knots to 14 knots. In addition to the ferry service, the Western Ladies were also used on excursions, especially to the River Dart. 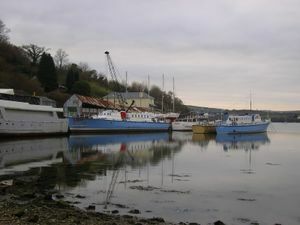 The company was sold in 1963, to Torbay Boat Construction Co Ltd, of the Dolphin Boatyard in Galmpton, with little effect on the operation, though the launches were a familiar sight at the Dolphin Boatyard for their winter layup - in the summer the whole fleet was moored on buoys in Brixham Harbour. In 1967 Western Lady III spent some time running cruises around Dublin Bay, under the sponsorship of the Irish Government. 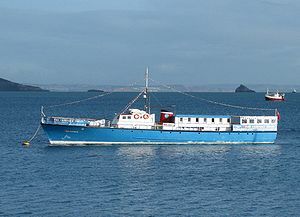 In 2003, the two remaining operational Fairmiles; Western Ladies III and IV were supplemented on the Torquay - Brixham ferry by the more modern MV Torbay Princess and MV Torbay Princess II. This arrangement lasted until the end of the 2006 season, when the Fairmiles were withdrawn, following the closure of the Princess Pier landing stage in Torquay, which was used by the Fairmiles; the more manouevrable Princesses use the fish quay inside the harbour, which is inaccessible to the Fairmiles. Western Lady III, by now the last Fairmile Passenger vessel (The Western Lady IV became a yacht), was bought in 2007 by Fairmile Classic Cruises, who operated her from Swanage in Dorset on circular cruises along the Jurassic Coast, and to Yarmouth, Isle of Wight. By early 2009, the company had run up debts, and the vessel had been impounded by the Maritime and Coastguard Agency (MCA). The owners of Greenway Ferry inspected her, and were given less than 24 hours to buy her by the harbour master, to avoid her being sold at auction to pay off the debts. This was achieved, and the Western Lady III returned to Brixham. After a brief call in Brixham, Western Lady went to Polruan in Cornwall, where she was given a major (£35,000) refit, to return her to MCA standards, and to refurbish her passenger accommodation in Art Deco style. She was renamed The Fairmile to avoid confusion with the services of Western Lady Ferry Service, and to emphasise her history. In August 2009, she returned to Torbay, undertaking a series of 'Welcome Home' sailings, with the guest of honour being one of her wartime skippers, Eustace 'Mac' Mackmurdo, aged 93. A Winston Churchill impressionist was also present, who gave a speech. The Fairmile replaced MV Riviera Belle on the day cruise route from Torquay via Brixham then along the coast to Dartmouth, and up the River Dart to Greenway Quay. Her additional capacity was needed on the route, as the competing service operated by MV Torbay Belle was withdrawn after the 2008 season, and in addition, the National Trust opened Greenway House to the public for the first time in 2009. As the landing stage at Princess Pier, in Torquay is no longer safe for use, The Fairmile moors inside the harbour on Princess Pier, whilst she moors overnight on a buoy in Brixham Harbour. Greenway Ferry have stated that they intend to continue with the restoration of The Fairmile over the next 5 years, with an emphasis on preserving her as a floating museum. ↑ 1.0 1.1 "National Historic Ships Register". http://www.nationalhistoricships.org.uk/ships_register.php?action=ship&id=307. Retrieved 6 November 2009. ↑ 3.0 3.1 Boyle, I. "Greenway Ferry". Simplon Postcards. http://www.simplonpc.co.uk/GreenwayFerry.html#TheFairmile.html. Retrieved 6 November 2009. ↑ 4.0 4.1 "Western Lady to Become Floating Museum". Herald Express. 11 July 2009. http://www.thisissouthdevon.co.uk/news/Western-Lady-floating-museum/article-1156902-detail/article.html. Retrieved 6 November 2009. ↑ 5.0 5.1 "Fairmile B Motor Launches". Western Lady Ferry Service. http://www.westernladyferry.com/page7.html. Retrieved 6 November 2009. ↑ 6.0 6.1 Langley, M & Small, S. (1984). Estuary & River Ferries of South West England. Waine Research Publications. ↑ Boyle, I. "Western Lady Ferry Service". Simplon Postcards. http://www.simplonpc.co.uk/WesternLadyFerryService.html. Retrieved 6 November 2009. ↑ "Mac, 92, helps welcome WW2 vessel back to Bay". Herald Express. 4 August 2009. http://www.thisissouthdevon.co.uk/news/Mac-92-helps-welcome-WW2-vessel-Bay/article-1222302-detail/article.html. Retrieved 6 November 2009. Shot 12 November 2009. The former " Western Lady 111" . The Fairmile rounds the headland and heads in towards the quiet waters of the river Dart and Dartmouth a welcome sight. Shot 12 December 2009. A short snip of Greenway Ferry's Fairmile out in a bit of a sea. Don't often get to see her red 'boots' like that. Looks like she'd have been better with a bit more power. This page was last edited on 5 May 2013, at 16:42.